Sikyong Lobsang Sangay, president of the Tibetan government-in-exile, will deliver the 2018 Berman Lecture at 7 p.m. Monday, April 9 at Emory University School of Law. He will speak on "The Tibetan People’s Transition to Secular Democracy." 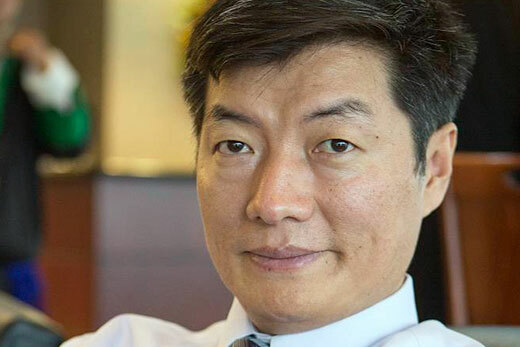 Sikyong Lobsang Sangay, president of the Tibetan government-in-exile, will deliver the 2018 Berman Lecture at 7 p.m. Monday, April 9, in Tull Auditorium at Emory University School of Law. He will speak on "The Tibetan People’s Transition to Secular Democracy." President Sangay was elected administrative head of the Tibetan government-in-exile, officially known as the Central Tibetan Administration (CTA), in 2011, with 55 percent of the vote. Shortly before Sangay’s election, His Holiness the 14th Dalai Lama devolved his political power to the CTA making Sangay the first leader of a secular, democratically elected Tibetan government. Sangay’s title was officially changed to sikyong, which translates as president, in 2012. He was re-elected in 2016. He supports the “middle way approach” to peace in Tibet, which represents the Dalai Lama’s vision of autonomy for Tibet within the framework of the Chinese constitution, similar to arrangements China has with Hong Kong and Macau. Sangay was born in an exile Tibetan community in India and graduated from Delhi University before receiving an LLM and an SJD from Harvard Law School. He was a senior research fellow at the East Asian Legal Studies Program, where he organized conferences with Chinese, Tibetan, Indian and Western scholars, including meetings between the Dalai Lama and Chinese scholars. “We are so very honored to have President Dr. Sangay speak to us on the Tibetan people’s experience of the transition to secular democracy,” says Silas W. Allard, associate director of Emory’s Center for the Study of Law and Religion (CSLR), sponsor of the event. The Harold J. Berman Distinguished Lecture was established in 2009 to honor the intellectual legacy of Berman, whose scholarship on the link between religious tradition and law evolved into what is now a thriving law and religion field. CSLR is the oldest and most recognized scholarly center in the field of law and religion. It engages scholars worldwide and offers six advanced degrees, 40 cross-listed courses, research projects, public forums and international conferences. The Berman lecture is free and open to the public. Go here to RSVP.